After 25 years in the retail customer service sector, it was time to develop what was my relaxing hobby into a full time business. Having always enjoyed creating what was pleasing to the eye and useful in the home, I focused on quality handmade furniture and accessories. There is no greater pleasure than discovering the beauty in a piece of timber and creating something that can be used and treasured for many years. We are located in the wooded foothills of the Ouachita Mountains in Roland Arkansas situated between Lake Maumelle and the Arkansas River. With the beauty of my surroundings as inspiration and these thoughts in mind, I wanted to make pieces available to my family, friends and clients (future friends) to value, cherish and hopefully hand down to future generations. Items available now are listed below and ready to ship. Some of these may be one of a kind, or there may be more of the items on each of the index pages for ordering, if you need additional product. Contact me for custom designs or other pieces I can build to your specs. Lead time on most custom items is just 2 to 4 weeks. Contact me directly when purchasing multiple items. I can save some shipping costs. Shipping costs will be added depending on destination. Please check our other pages for useful and decorative handmade items for your home. Thanks for visiting and supporting a small business. Available in Black Walnut or Cherry. Approximately 21 1/2" x 11" x 1 1/2". Finished in household mineral oil. 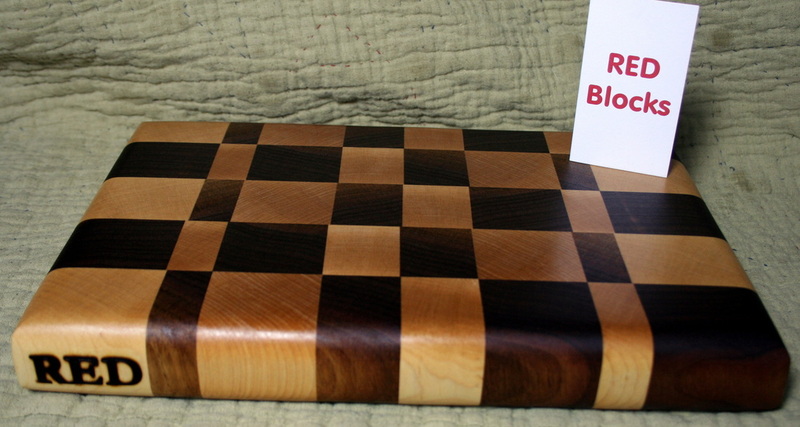 Available in Black Walnut or Cherry. Approximately 18" x 9 1/2" x 3/4". Finished in household mineral oil. 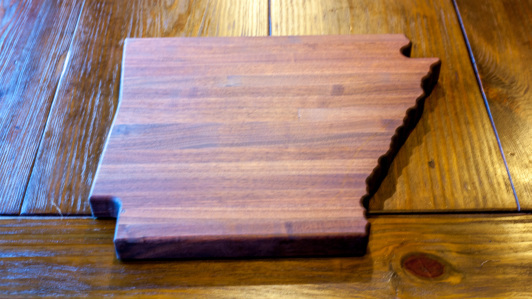 Edge Grain Arkansas Cutting Board. Available in Black Walnut or Cherry. Approximately 17" x 14" x 1 1/2". Finished in household mineral oil. Contact me for other state designs. Available in Black Walnut or Cherry. Approximately 12" x 10" x 3/4". Finished in household mineral oil. Contact me for other state designs. These mini butcher block boards are wonderful for cheese,bread, vegetables or as a serving board. Measures 6" x 11 3/4" x 1 1/2"